Next review LeafFilter North - Bad product. Water runs off behind and in front of gutter. Ruins landscape. Jul 05, 2018 Hi Ira- We appreciate your feedback and are glad we were able to resolve your concerns over the phone. If you have any further questions or concerns, please reach out to our service and support team at 800-749-4566. 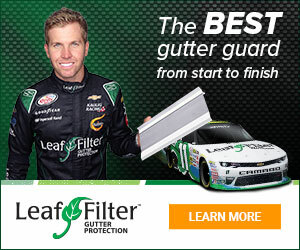 While I have no issues with the installation or results of the LEAFFILTER SYSTEM, I do take issue with the cost. When the sales person came and measured my home and explained how the system works, he then gave me a quote of $8000., when I told him I had to discuss it with my wife and son, he came down to $5060. and I foolishly agreed. After the installation I called my insurance agent and asked if the Leaffilter would lower my premium. He asked me how much it cost and I told him, he said for a top of the line gutter guard system with size of my house it should be no more than $2500. I have called Leaffilter numerous times to discuss this and was told someone from the sales office would get back to me. I am still waiting. They also had a credit card sent to me which I did not ask for. Review #1294393 is a subjective opinion of DevotedHornedFrog.